Are you familiar with bottle trees? In parts of the American South–places like Mississippi, Alabama, and Takoma Park, Maryland, there is a tradition of stringing empty glass bottles from the branches of trees, or inverting them over twig ends on the trees. The result can be quite lovely and, seemingly, effective. The tradition holds that in addition to being lovely the bottles pose a certain attraction to malevolent spirits who are then moved to enter the bottles, becoming entrapped. A variant of the tradition has the spirits dying in the rays of the rising sun. This is a pretty satisfying tradition, worthy of adoption and one that fits right in with the environment in which I live in Las Galeras. And so I have a bottle tree–two in fact, one of which is over six meters tall and made of reinforced concrete. The other is more natural and a bit closer to home. Call that second one the penultimate layer of defense against any evil spirits who happen to make it past the towering structure erected near to where my lane diverts from the two-track road on our little hill. This “tree” is guarded by an alarming-looking baby doll wielding a reflective shard of broken mirror. (I break from the bottle tree tradition at the ultimate layer of defense…but that’s another story.) In keeping with tradition, I choose to believe that blue bottles are best for this purpose, although red ones are also quite effective. Those of you who have traveled in the Dominican Republic know why green bottles are the RD default whenever bottles are called for in any quantity. I have lots of green bottles on my trees, and a few brown in addition to the blue ones. I’m looking without letup in the RD for blue bottles and in the US also. When traveling from the United States to the Dominican my luggage is something of a marvel for the TSA crew in Washington and for the Dominican customs inspectors when I arrive in the RD. A raft of blue bottles in the suitcase is certainly in keeping with the typical contents of my checked luggage. In both countries friends have begun to save the occasional blue bottle for me. You, too, can play along, if you wish. Recently I’ve planned a trip to Switzerland to visit dear friends and to take custody of a particularly unusual and elegant blue bottle lovingly retrieved from atop a recycling bin in Herzogenbuchsee. My mom has contributed a couple of bottles from Wisconsin a few years ago, and I just the other day negotiated the purchase of a couple of giant German wine bottles from a St. Vincent de Paul thrift store in Seattle (2 for $5.) 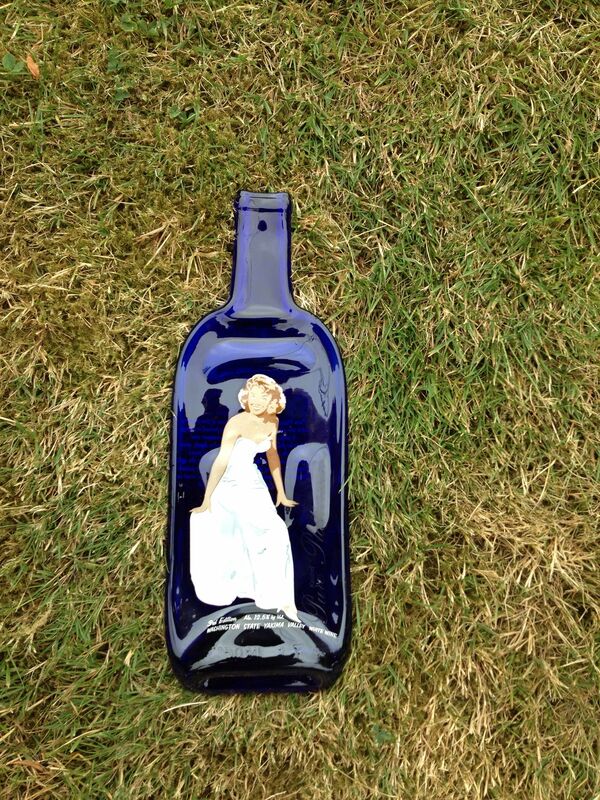 A couple of weeks ago some friends on the Long Beach Peninsula offered up a couple of wine bottles from the Yakima valley, which bottles were decorated with an illustration of a blond in a swirling white dress. Seemingly Yakima’s version of Marilyn Monroe posing over a ventilation grate and selling wine. Coincidentally, the very next stop on this particular odyssey across the United States was to spend a couple of days with some artist friends on Vashon Island. Some of their work is in glass and they have a kiln. So it seemed a natural for me to melt one of the painted bottles flat and slowly anneal it over the many hours necessary to solidify without cracking. This resulted in Flat Marilyn.